Yamaha has been rolling out some interesting YouTube fodder lately, with the most recent installment being a short video that features the five project leaders from the different generations of Yamaha YZF-R1 superbikes. Unfortunately, we don’t get to hear too much from the Japanese project leaders, other than a quick one-line synopsis of what their project goals entailed, but we are treated to some good visuals of Valentino Rossi flogging the 2015 Yamaha YZF-R1 down the race track. The best part of the video though might be the pride shown by these project leaders — they look like proud fathers standing next to their creations. Racing season is now truly upon us. MotoGP kicked off ten days ago at Qatar, last weekend the British Superbike championship had their first race of the year at Donington Park, and this weekend sees a bumper crop of racing. MotoGP is at Austin, where MotoAmerica also kicks off its inaugural season since taking over the AMA series from the DMG. World Superbikes heads to the Motorland Aragon circuit in Spain, where they are joined by the Superstock 1000 and Superstock 600 classes. It is going to be a busy weekend. Despite the bustle of action, the amount of real news emerging has been limited. Teams and riders are too busy racing, absorbing the lessons of the first races while preparing for the next races, to be plotting and scheming beyond that. Here’s a rundown of things you might have missed anyway. 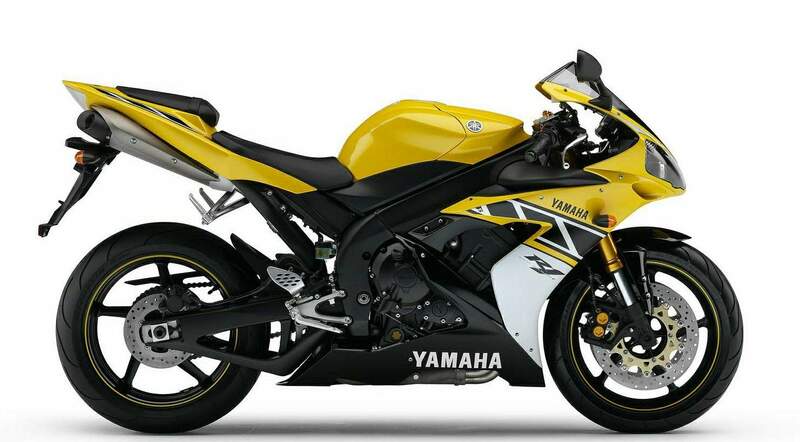 The 2006 Yamaha YZF-R1 LE livery, which was a yellow, black, and white homage to Kenny Roberts Sr., is perhaps the greatest livery ever to adorn an R1, straight from the Yamaha factory. Whether you are a loyal subject of King Kenny, or you just enjoy the fetching, yet simple, racing design, the Roberts livery is a treasure to see in any form — but especially so at speed. Giving us a glimpse as to what the 2015 Yamaha YZF-R1 would look like with such a limited edition paint scheme, Oberdan Bezzi has once again whet our appetite ahead of a weekend full of riding. And for you Giacomo Agostini fans, there is something special waiting for you after the jump as well. Enjoy! The long-winded “Yamaha France GMT 94 Michelin Racing” team is ready for FIM Endurance World Championship action this year, especially with the all-new 2015 Yamaha YZF-R1 motorcycle. The new R1 offers state-of-the-art electronics, as well as near-200hp from its crossplane four-cylinder engine, and the French team is looking to capitalize on those improvements in the EWC for 2015. Yamaha France took the 2014 title in a convincing fashion, so it will be interesting to see what riders David Checa, Kenny Foray, and Mathieu Gines can accomplish with their new toy. We’ve got a bevy of high-resolution photos for you, after the jump. The international moto-press was gathered in Australia this week, some for World Superbikes at Phillip Island, and others for the 2015 Yamaha YZF-R1 launch at Eastern Creek. While we’ll have our assessment of the new R1 and R1M for you to read on Wednesday, we thought we would whet your appetite with some on-board footage. Lapping at the Sugo Circuit in Japan, we get to see the new YZF-R1M go through its paces, quite convincingly we might add, but more importantly, Yamaha has visualized the electronics data coming from the superbike. Lean-angle and acceleration telemetry comes from the R1M’s IMU, and the graphics also include when the traction control, quickshifter, wheel-lift control, and our personal favorite: slide control, are aiding the rider. A visual, aural, and technical delight — we think you will enjoy the video, after the jump. As expected, and leaked earlier today, the 2015 Yamaha YZF-R1 has broken cover at the EICMA show in Milan. An all new machine from Yamaha, the new YZF-R1 is a giant leap forward from Yamaha, with its eyes squarely on dominating the race track, throughout all racing leagues. At the core of the new R1 is a new crossplane motor, now dubbed the CP4 engine, which is producing 200hp without ram-air. The engine features titanium fracture-split con-rods, 10.5 liter airbox, titanium exhaust, and a slipper clutch to boot. For the 2015 Yamaha YZF-R1 though, the story is really all about the electronics. The 2015 Yamaha YZF-R1 has leaked ahead of its EICMA debut today…with two images of the superbike hitting the interwebs just a few hours ago. The model shows obvious lines from the Yamaha MotoGP bike, the YZR-M1; and is expected to come in two trim levels, one for the street, and the other for racing purposes. We should know more about the new R1 in a few hours, but until then, we will have to chew on these first photos. Accordingly, we’re not so sure about the headlights, though they look verrrry easy to remove, which might be a salient feature for them, on a homologation special. A new R1 for the 2015 model year has been rumored heavily for almost a year now, and today Yamaha confirmed that we will see a new Yamaha YZF-R1 at the EICMA show. The perhaps isn’t surprising, especially since Yamaha teased us this very info at the INTERMOT show last month. However, this is the first official confirmation from the tuning fork brand, as well as our first non-spy photo glimpse, of the new liter-bike. All of course to whet our appetite.